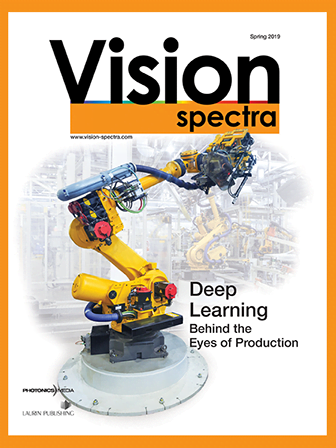 When designing a robotic machine vision application, one thing to consider is whether to mount the camera on the robot tooling or fix it to a permanent structure. Both camera mounting styles have advantages and disadvantages depending on the application. Users choose fixed-mounted cameras more often than robot-mounted cameras. Typically, the faster cycle times and greater reliability of fixed mounting are more important than the flexibility that robot-mounted cameras offer. But fixed mounting is not the best choice for all applications, and it is good to know the pros and cons of each mounting method. A FANUC M-900iA/360 robot picks up a compactor drum and presents it to three ARC Mate 100iC robots equipped with iRVision to locate parts for welding. All four robots work in coordinated motion. A robot-mounted camera application involves installing the camera and often the lighting on the robot’s end-of-arm tooling. This approach allows the robot to position the camera in many different locations. For many applications, robot mounting allows a single camera to function as multiple fixed cameras. The greatest disadvantage is increased robot cycle time because positioning the camera has to be part of the robot cycle. Fixed mounting involves installing the camera and lighting to a permanent structure in the robot work cell. In most applications, the camera can snap and analyze the image while the robot is performing other tasks, reducing or eliminating the vision portion from the overall robot cycle time. Since the fixed camera is unable to move, however, multiple cameras are often needed in the work cell to perform multiple tasks. Another factor to consider when deciding to mount the camera is routing cables. With a robot-mounted camera, routing up the robot arm to the end-of-arm tooling is a challenge for most applications. Camera cables can be high flex, but even then they tend to be susceptible to damage if not properly routed. One of the largest points of failure in a robotic system is cables, and the camera cables are no exception. A FANUC LR Mate 200iD robot uses iRVision for high-speed assembly. These tend to be more reliable and last longer with a fixed-mounted camera, as they do not have to move with the robot. This significantly reduces the risk of damage. Robot-mounted cameras themselves also are more difficult to install than fixed-mounted cameras. But once the camera is properly mounted to the robot tooling, it can be easily accessed by moving the camera to a convenient location. The complexity of mounting structures varies with the application. In some cases, the structure can be quite large and complex. Fixed mounting can more easily accommodate complex structures. But keep in mind that once the cameras are fixed-mounted, they are often very high in the work cell and very difficult to access for adjustments. Calibration defines the relationship between the camera and the robot in order to provide the location of the workpiece relative to the robot arm. With a robot-mounted camera, applications that have multiple camera views based on different robot positions can have a single calibration. This is possible because the calibration sets up the relationship between the robot arm and the camera, no matter the robot’s position. In contrast, for a fixed-mounted application that has multiple cameras, a different calibration for each is required. Robot mounting also offers an advantage when it comes to flexibility. Adjustments often can be made by changing the robot’s position. With fixed mounting, positional adjustments may require the reworking of the camera structure or camera-mounting hardware. In some cases, applications require the flexibility of a robot-mounted camera, but are not suited for mounting the camera on the robot’s end-of-arm tooling for the entire production cycle. In these applications, one solution may be the use of a hybrid system in which the robot grabs an enclosed camera, uses it, and then returns it to a fixed position. Since the robot is not required to hold the camera during its entire cycle, the cable routing can be simplified by not running it up the robot arm. Josh Person is an engineer at Fanuc America with 14 years of robotic machine vision experience and over 20 years of experience in automated manufacturing; email:joshua.person@fanucamerica.com.